Greston Paltraki was found, alone, on his ship by the Thirteenth Doctor, Yaz, Ryan and Graham. Because he had been exposed to the psychotropic waves on the planet Ranskoor Av Kolos, Paltraki couldn’t even remember his name. When the TARDIS receives nine distress calls from different ships on the same planet, they arrive on Ranskoor Av Kolos, translated “Disintegrator of the Soul,” and don neural balancers to protect them from violent psychotropic waves pulsing through the atmosphere and anyone who’s crash landed in this graveyard of spaceships. 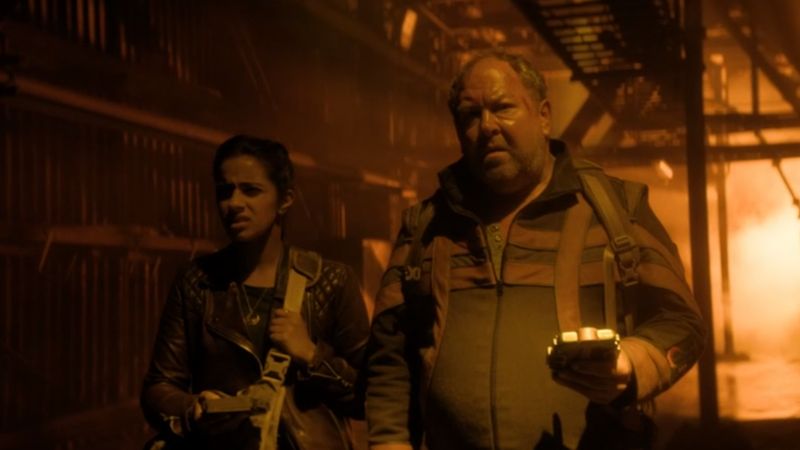 They run in to Greston Paltraki (Mark Addy) a merchant captain who’s lost his crew to The Creator, who wants a stolen artifact, a large diamond object with a pulsing black center, returned. The Creator? Tzim-Sha. Graham turns grim, calmly informing the Doctor as they make their way towards the ship that he has every intention of killing Tzim-Sha, and even her promise to kick him off Team TARDIS won’t stop him. The ship, resembling the First Light on steroids, is an Ux temple, previously manned only by nature-benders Delph and Andinio, but now perverted and commandeered by Tzim-Sha, who has convinced them he’s their god for over 3000 years. Sending out her team armed with trackers, coms, grenades, code breakers, and a bomb, the Doctor gets Andinio’s attention and confronts Tzim-Sha, who’s harnessed the Ux technology and blended it with the Stenza’s database to carry out his revenge against the Doctor. His particular technique is to plug Delph, the main power source, into a throne-style antenna and use Andinio, the true believer, as a driver. They reach out with their mind and capture entire planets, compacting and depositing them into the artifact stasis pods, held hostage in the control room. Excited to meet the Ux and dismayed at their abuse at Tzim-Sha’s hands, the Doctor points out there’s only so long that will work, because nature will resist, and those planets cannot be in the same place at the same time. Graham and Ryan find the stasis pod room where Paltraki’s and other crews are held, arguing all the while about what Grace truly would have wanted. Graham feels adamant that Grace wanted to live and was really good at it and would have told him to do something about it if he could. Ryan, however, says she always told him to be the better man. Plus, he wants Graham to live, because he loves him, he admits at last, humorously rolling his eyes while Graham stands agape. They manage to break most of the prisoners out and send them with Paltraki before Tzim-Sha realizes what’s happening and stalks off to find them. With sparks flying, Delph screaming, and Andinio praying, the police box beacon reaches out and sends each planet back to its place. Everybody lives. After sending Ryan and Paltraki down to the planet with the survivors, Graham stays behind and waits for Tzim-Sha, but is unable to pull the trigger. Fortunately, Ryan swoops in and attracts Tzim-Sha’s attention, giving Graham an opening to shoot the alien in the foot. They deposit him in a stasis cell, giving him one last word to think on for all eternity: Grace. The Doctor is impressed with Graham, calling him one of the strongest people she’s ever known. Paltraki promises to take everyone back home and the Ux, needing to re-evaluate after their experience, decide to travel the universe and get some perspective, an outlook the Doctor approves of, of course. The planet of Ranskoor Av Kolos, where Paltraki’s ship was located. But, long before he landed here, he had a hard life out in space. Being born on a distant planet, much like Earth in the fact it can sustain life, but he had never heard of Earth until Dr. Who had mentioned it to him. He was orphaned as a child, raised by a woman he would come to call his mother. She was kind for the most part, but neglected him in some regards as she was trying her best to raise him. Which meant, she had to work hard, and spend time away from him in order to do so. That had Greston spending a lot of time alone. When he was old enough, he sought out his own life to do what he wanted, without having to rely on others. Around the age of 15, he hopped aboard a ship that was carrying people out to explore space, and seek out new planets to colonize. But, as the people found their desired locations, Greston made up his mind that he would remain on the vessel. He was invited to be apart of the crew, and rise through the ranks as far up as he could go and managed to do quite well. Years past before he took up a suggestion from a crew member, whom had become friends with the young man, and went out to find a ship of his very own. All of this left him with little time for relationships, so the encounters with females didn’t ever last. When he felt he wanted companionship, he never had it. So, that left him always feeling lonely when he took the time to allow his emotions to come out. Once he had a ship of his own, it wasn’t much to be desired. But, he hired a ragtag crew and they got to work fixing it up. The missions were always the same, -bring goods from one location to another. On his travels, there were times he’d end up with cargo that had been stolen from others. But, he either would be unaware of this, or he would not care. He just wanted to get it done and get paid. The ship was upgraded during his years as captain, doing plenty of shipments to earn him enough to ensure his life was decent. But, he bit off more than he could chew when he had an object wanted by Tzim-Sha (Tim Shaw). Without the help from Dr. Who, he would have remained on Ranskoor Av Kolos, without a clue. After going through what he had with the Doctor, he did what he had promised to her, then continued on with going through space on his ship. There would be times when he would reunite with Dr. Who, and help her whenever she might need him. Doing cargo runs would get boring without the excitement like he had when with her, wanting to go against enemies and live the life of a proper space traveler such as she was. So, when he felt she would allow it, he will ask to go along with her. He would hope that he would get the chance often, as he had grown attached to her in their short time together during their first meeting. He will always feel in debt to her for helping him, and there will come a time soon when he would want to see Earth, and spend time there. His hair is short, light brown and graying. Most times his facial hair is not shaved, and he’ll seem a mess. But, when he’s in a good mood, he will shave before getting a beard. His weight is 240 lbs. He has several scars over his body, but nothing of great significance.